Shrimp Dip is a delicious hot appetizer perfect to serve for any occasion. There is loads of shrimp, bacon, cheese, veggies, and Cajun spices all combined into a spicy hot dip. Cajun Shrimp Dip is easy to prepare in about 30 minutes but it can also be made ahead of time and baked as needed. 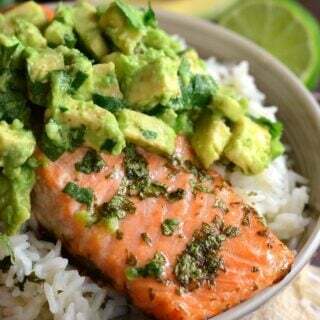 Serve it with toasted slices of bread, crackers, pita chips, or pretzel chips. Being a huge fan of hot cheesy dips, I have several other hot seafood dips to offer. 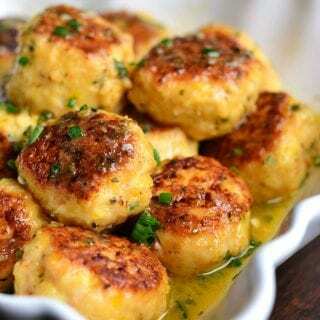 Seafood Cheese Dip combines scallops and shrimp in a cheesy, aromatic appetizer. 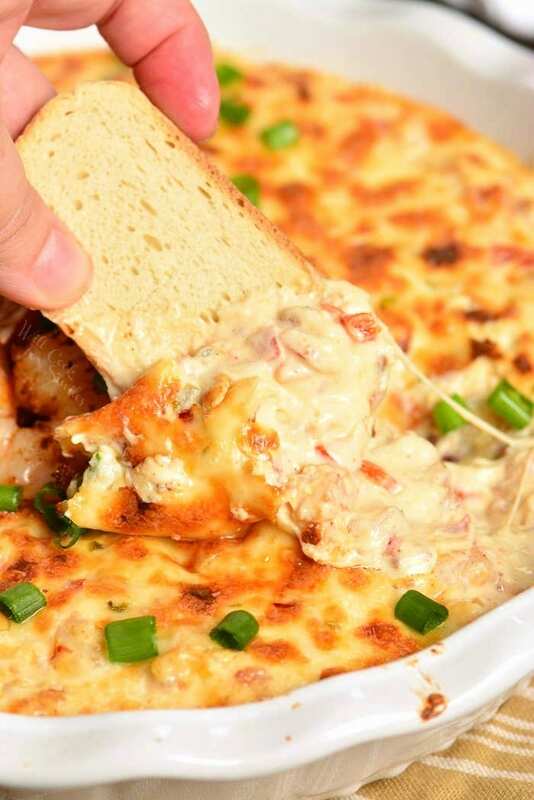 Noone can refuse a classic Hot Crab Dip that’s loaded with flaky crab meat and cheese. 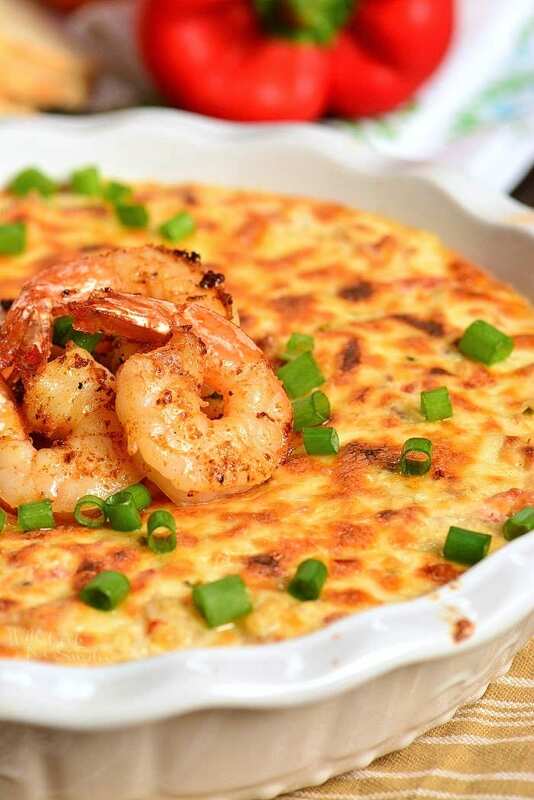 Of course, Parmesan Shrimp Dip is always a satisfying easy dip to whip up. I will take shrimp any way it comes but combine it with cheese into an amazing creamy dip, and I will climb a mountain to get to it. 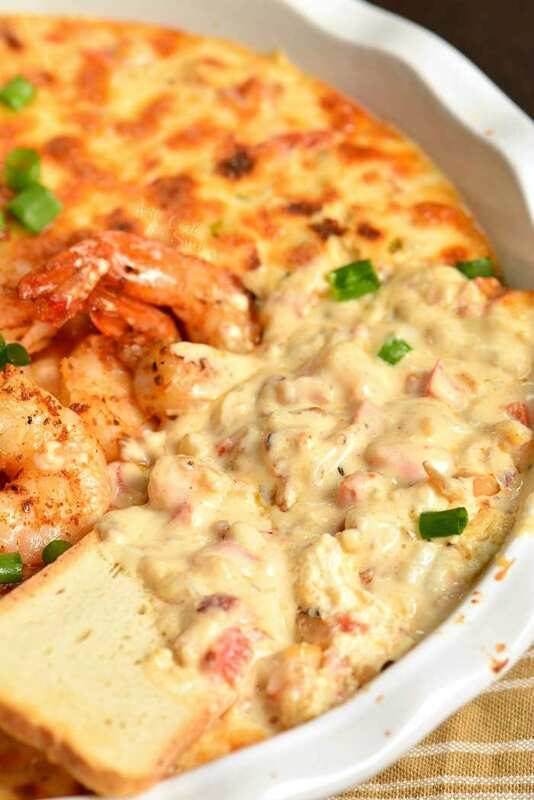 Everyone will be climbing over each other to get to this shrimp dip. 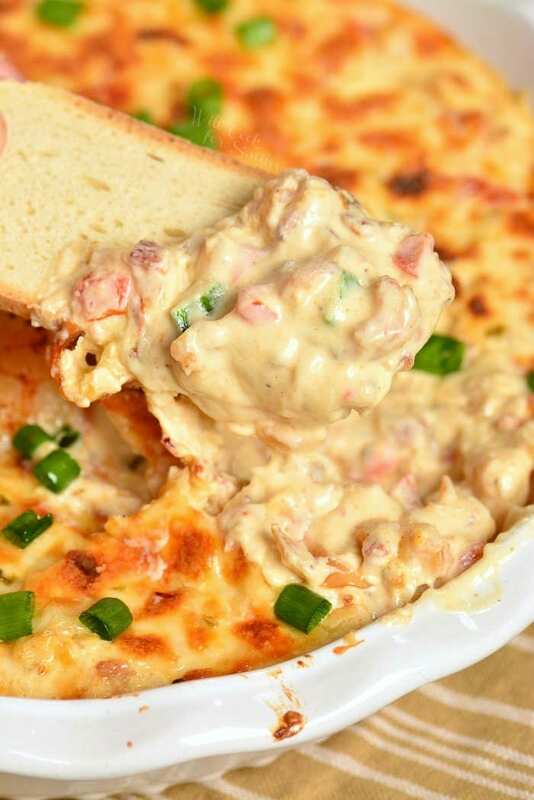 This shrimp dip is a perfect combination of spicy and creamy. It’s made with cream cheese and Pepper Jack cheese. To make it a tad spicier, I’ve added some jalapeno cheese too. Jalapeno cheddar cheese tends to be a little spicier than Pepper Jack cheese so you can decide for yourself if you want to add it or not. To bring extra Cajun flavors into the dip, I’ve added sauteed red onions and red bell pepper. Shrimp is also coated and cooked in Cajun seasoning and there is more seasoning added to the dip itself. 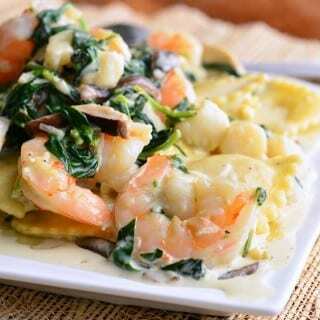 This is a beautiful combination of spicy cheeses, Cajun seasoning, juicy shrimp, and vegetables. You can serve it with many different crackers, bread, pita chips, pretzels, and even bell pepper slices as a healthier dipper option. When choosing shrimp for this dip, you can choose frozen or fresh, in shell or already peeled. If using frozen shrimp, make sure to defrost completely first. If using shrimp in shell, make sure to peel and clean out the shrimp first. Preheat oven to 375 and grease a baking dish big enough for the dip. In a mixing bowl, combine softened cream cheese, grated Pepper Jack cheese, grated Jalapeno cheese, and Cajun seasoning. Mix thoroughly, until evenly combined. Chop raw shrimp into small pieces and mix with Cajun seasoning. Set aside. Dice bacon, red onion, and red bell pepper. Preheat a cooking pan over medium heat. Add a tablespoon of oil to the pan and add bacon. Saute until bacon bits start to crisp and add veggies. 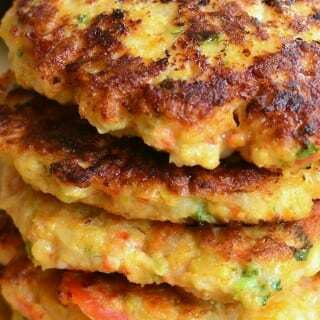 Season with a little salt and cook until veggies are soft and start to brown. Add shrimp to the pan and saute just until shrimp turn opaque. 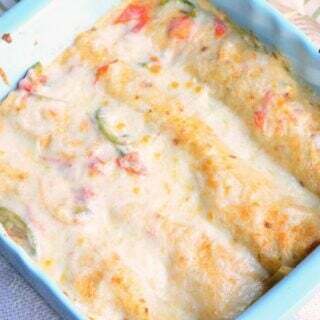 Add shrimp and vegetables to the mixing bowl with cheese and fold until it’s mixed throughout. Transfer into a baking dish and spread it evenly. You can spread about 1/2 cup grated Pepper Jack cheese over the top. CAN SHRIMP DIP BE MADE AHEAD? Absolutely! Prepare the dip all the way through mixing all ingredients in the bowl. Instead of baking the dip you can transfer it into the baking dish and cover completely with saran wrap or a lid (if the baking dish comes with an air-tight lid). 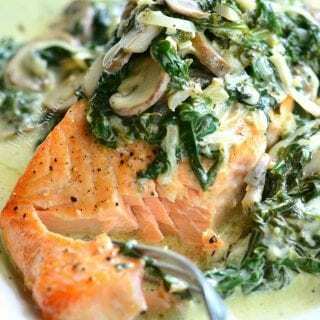 Refrigerate for up to 24 hours before ready to bake. Spread some cheese over the top and bake at 375 for about 20 minutes. 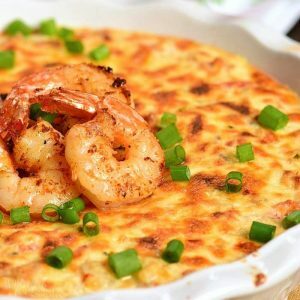 Shrimp Dip loaded with chopped shrimp, cheese, veggies, and Cajun spices all combined into a spicy hot dip. Spread about 1/2 cup grated Pepper Jack cheese over the top.